Go to Interweave.com to sign up for all sorts of interesting newsletters CPS as well as Quilting Arts, Beading Today and others. 1. Play around with your own handwriting, creating words and entire alphabets with all the pens or markers on your desk. 2. Write several pages of words and alphabets in many styles of letters, upper- and lowercase, large, small, tall, wide, skinny, and fat. Don't judge, just write pages and pages, sampling your letter flow and creativity. 3. Doodle letters with colored markers. Add colorful patterns, swirls, stripes, lines, and dots to embellish the letters. 4. Look through old magazines and other printed materials to find words and phrases in assorted typefaces and sizes that you find interesting. Cut them out and paste them in your journal. Become a pasting pack rat with anything that you hand letter and make sure it ends up in your journal. 5. Using assorted markers, color in layers and add words on top of each layer. 6. Collect brochures or magaz ine clippings with interesting letter placement and unusual compositions and layouts of text to inspire new ideas and direction for your lettering projects. Which one of these tips speaks to you the most? Do you have a lettering tip to share? Personally, I like to experiment with different sizes of pen tips. Fine tips are great for details, but wider tips seem to let me write more loosely. 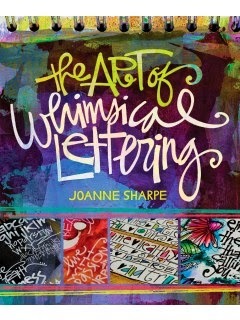 If you love lettering, click here to share this with your followers on Twitter. Your classes are always sew much fun to be in...... we'll have to see what I can work out.